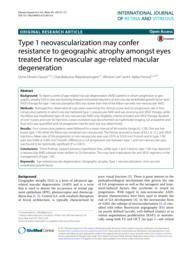 To report a series of age-related macular degeneration (AMD) patients in whom progression to geographic atrophy (GA) in one eye receiving frequent intravitreal injections of anti-vascular endothelial growth factor (anti-VEGF) therapy for type 1 neovascularization (NV) was slower than that of the fellow eye with non-neovascular AMD. Retrospective, observational case series examining the clinical course and GA progression rate in four consecutive patients in which one eye harbored type 1 neovascular AMD and was receiving anti-VEGF therapy, while the fellow eye manifested signs of non-neovascular AMD only. Eligibility criteria included anti-VEGF therapy duration of over 4 years and over 50 injections. Lesion evolution was documented via multimodal imaging. GA at baseline and final visits was quantified and GA progression rate for each eye was determined. Four consecutive patients were followed for a mean interval of 94 months (range 62–120). One eye harbored type 1 NV while the fellow eye remained non-neovascular. The former received a mean of 65.5 ± 15.2 anti-VEGF injections. Mean rate of GA progression in non-neovascular eyes was 0.076 ± 0.024 mm2/month and in type 1 NV eyes was 0.004 ± 0.005 mm2/month. Difference in GA progression rate between type 1 and non-neovascular eyes was found to be statistically significant (P = 0.001). These findings support previous hypotheses that, unlike type 2 and 3 lesions, type 1 NV may represent a neovascular AMD subtype more resilient to GA formation. This may have implications for anti-VEGF regimens in the management of type 1 NV.